What a great way to get started sewing! Each project is designed specifically for an optimal learn to sew experience. Progress at your own pace in your own home with your own sewing machine. Level One is really really easy and suitable for small group activities or a quick afternoon's entertainment in addition to being the groundwork for basic sewing knowledge and skill. Levels Two and up are more difficult and designed for advancement of garment construction skills after the basics of Level One are mastered. After that, projects and lessons become more complicated and rely on the basics learned in these first two lessons for a successful, wearable, neatly constructed garment. All projects are educational and taken together make an excellent sewing curriculum. At the end of all six Units, you'll be able to sew any clothing, anytime, regardless of pattern brand or whether or not the instructions that come with it make any sense. It's an accepted fact among home sewists that the instructions in a regular pattern are tricky to understand at best, and can be truly difficult or confusing. The language is unfamiliar. the pictures show too many things at once, and the whole thing is compacted to fit on one or two pages. Your DIRECTIONS Sewing Lesson has instuctions that are clearly laid out, one at a time, with extra pictures throughout and plenty of pages to describe everything. Plus, we give you so much more than just a pattern and a guidesheet like you can get on sale at the stores. It's actually an entire sewing lesson in a package. In addition to your patterns, you also get all the books, educational materials, and extra learning enhancements you will need. 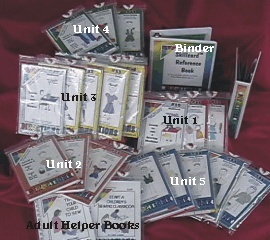 They are all included in every Lesson Module Packet as part of the Sewing Lesson. 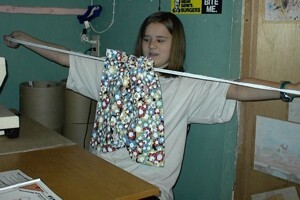 You add only fabric, a sewing machine, and basic notions. How old do you have to be to learn to sew? This is a super program for younger girls. Sometimes 5 & 6's can use it; you know your child best. Older kids and adults can definitely use it if they want to. It can be used as a complete home-school sewing curriculum. Any teen, boy or adult can learning to sew with our program. If a person doesn't know how to sew, they still have to start at the beginning regardless of age or gender. However, one should be aware that DIRECTIONS is specifically designed for the 7 to 10 year old female and that is who will learn the most the fastest by using our systematic approach to learning. That's it! If you can do those three things, you can learn to sew today with easy to sew Unit One lessons (literally within about 10 minutes if you choose our Unit One ebooks) no matter how old you are - 5, 6, 7, 8, 22, 38, or 59 - whatever age you are, you start at the beginning, with Unit One Beginner Sewing Lessons For Kids. If you'd rather have the hard copy Lesson Modules shipped to you, we can do that too. 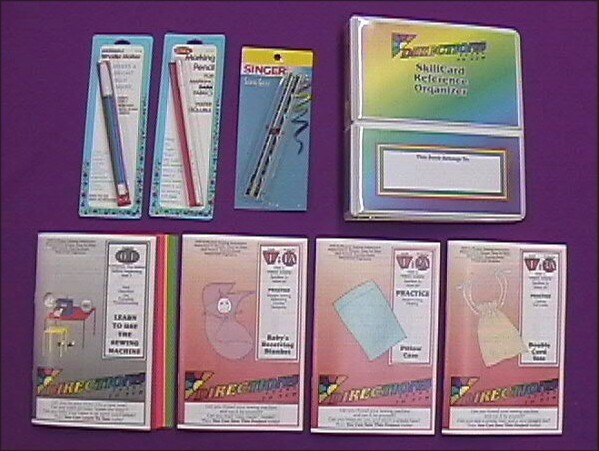 We have several dozen Lesson Modules, each focusing on a specific sewing skill. We also have several Lesson Modules Ebooks for students and a few accessory helper Ebooks for the student's grownup that are available for download immediately after payment. Do take advantange of a better way to learn. Browse around a bit or just go straight to the "Kits & Sets" category at the top left menu area and get the Beginner Learn To Sew Kit. You can mix hard-copies and Ebooks in the same order. Your links will appear in Your Account for you to click on, and the hard copies will be shipped to your home. Normally a student will start with Level One, possibly with Zero-One if they have never used a sewing machine before at all. There's a nice Beginner's Kit in the "Kits & Sets" section. Each Lesson Module is numbered to reflect both the LEVEL and the LESSON within the level. This keeps your student organized and systematic with the new learning and education. Take it at your own pace, sew a little or sew a lot. It's more important to relax and enjoy the process to ensure a lifetime of loving sewing. Students who try to go really fast will end up with a general distaste for sewing. And that's a bad thing. The first number is always the UNIT or LEVEL, and the second is the LESSON. For example, Item #23 is in Unit 2, it is Lesson #3 and item #41 is in Unit 4, it is Lesson #1. Additionally, each unit is color-coded to match both our logo and progress through the natural spectrum of colors. Unit 1 is red, Unit 2 is orange, Unit 3 is Yellow, and so forth. Most people will order a full Unit Set at one time, and then place an order for the next Unit Set when the student begins the last lesson in the current Unit. Some people will buy the entire package at once. You will find both these sets and more in the "Kits & Sets" department. Single Lesson Modules are listed in their corresponding category.